The Independent National Electoral Commission,INEC, has declared presidential candidate of the All Progressives Congress, APC, President Muhammadu Buhari as the winner of Nigeria’s 2019 presidential election. INEC Chairman, Mahmood Yakubu made the declaration on Wednesday morning at the ICC Collation center in Abuja. This follows the official announcement of results from 36 states and the Federal Capital Territory (FCT) by the commission. 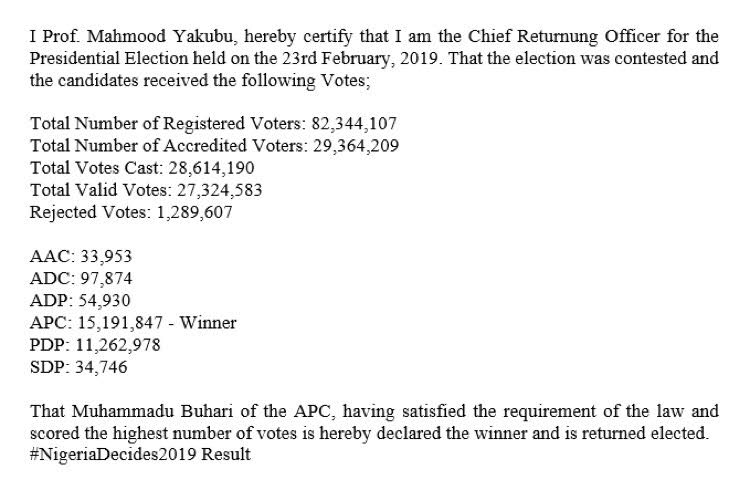 Buhari polled a total of 15,191,847 votes, compared to the 11,262,978 votes recorded by Atiku Abubakar, the presidential candidate of the Peoples Democratic Party (PDP). While Atiku has gained more votes, winning the incumbent President with wide margins in States in the South East and some in South-South, Buhari gathered insurmountable strength in the North. A total of 73 presidential candidates participated in the election which held on Saturday.